There is no perfect type of marketing. Either customers really love it, but marketing teams hate it. Or marketing teams love it, but customers hate it. One that is so insanely expensive to sustain over any length of time, that only super brands such as Apple, Nike, and Budweiser can afford it. One that regularly steals from your bottomline. Or one that makes some customers so angry, that they vow never to look at the offending brand ever again. Are we destined to love to hate all forms of marketing? 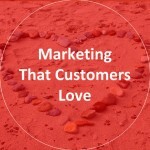 Or could there be a form of marketing that both marketing professionals AND customers could really, truly love? Marketing that focuses on sales volume and optimizing each purchase (e.g., conversion rate). Because you want the sale badly enough, you’re willing to offer a discount or do whatever it takes to make the sale. People buy from you essentially because you pay them to. Yuck. That doesn’t feel good. In many cases, the customer has the upper-hand in this type of marketing. Most customers know this and take advantage of it. They will scour the web for an online coupon, abandon their cart in hopes of a “wait, don’t go” coupon offer, or you simply promote the offer everywhere on your site to preemptively avoid losing the sale. The company with the better offer almost always wins. You are at the mercy of your customers, and customers can be fickle. Emotionally-driven, campaign-based marketing tactics that are usually unique and memorable. Disruptive marketing aims to create brand awareness and drive brand engagement. It’s not about the sale, it’s about the brand. Oh wait, you don’t have millions and millions of marketing dollars to spend every month? Outta bucks, outta luck. Super Bowl commercials, Dove True Beauty, Red Bull Stratos. Customers love to be entertained. It costs a lot to be clever and memorable all the time. There is rarely a good way to measure ROI. Getting it right is like winning an Oscar… very few companies have a break-through performance. Advertising that is designed to yell really loudly and get in front of a customer’s face in order to be noticed. It may generate immediate action by the customer, but this type of marketing makes no lasting impression. If disruptive marketing is memorable, interruptive marketing is forgettable. As a result, companies keep dumping more money here into perpetuity – all the while slowly eroding customer trust and patience. Pop-ups, banner ads, infomercials, billboards. It’s annoying. Also, it’s annoying. It’s tangible proof to your executive team that you’re doing something because it’s highly visible, you’re getting your products and brand “out there,” and it’s almost always measurable. And it works… for awhile. Marketing that focuses on starting and nurturing a long-term relationship with customers and prospects. It’s a mutually beneficial relationship. You help customers and they buy and stay loyal to you in return. You remember their name. You might even remember their birthday. You are a trusted resource, friendly, and you give back to their community or their pocket book through rewards programs. It’s cheaper and easier to keep a customer than to find a new one all the time. You can track almost everything — down to the specific individual — and calculate their total lifetime value. Also, it makes your limited marketing dollars go further.